Last week the Briefings to government ministers (BIM) were published. I’ve already looked at what the Ministry of Transport (MoT) and NZTA have said about transport in Auckland and so in this post I’m going to look at some of the other points mentioned in the documents. In particular what they say about long term trends and funding issues. Perhaps the most significant aspect in the BIM from the MoT is that they are finally starting to acknowledge the transport world is changing. That demographics are shifting and people are starting to think and use transport differently to the trends that have persisted for around 60 years. Of course these are the same issues we regularly talk about and previously the ministry seem to have taken “it’s a blip” approach the the real world results. As such it was a pleasant surprise to finally see such an acknowledgement from them. Along with the talking about the huge population growth expected in Auckland the briefing notes this important point about the biggest demographic group in most western countries. By 2036, the number of people in New Zealand aged 65 and over is forecast to double to 1.2 million. The ageing population is more pronounced outside of the major urban areas and international data suggests that individuals halve their vehicle kilometres travelled when they retire. This is likely to radically change transport demands in the regions and reduce the revenue base available to maintain the transport network and meet social expectations for levels of service. Our large older generations halving their car travel would have a massive impact on the demand for new roads in particular. As that happens the demand for Super Gold cards is going to soar. The next section almost had me falling of my seat when I first read it. Around 96 percent of personal travel in New Zealand occurs in private vehicles. Historically, the total distance travelled by private vehicles has increased consistently over time. This consistent growth has been driven by an increase in population and the number of vehicles in the fleet, and an increase in the distance travelled on a per capita basis. However, as shown in figure 2 below, this growth has stalled in recent years. The average distance travelled per-person in light passenger vehicles has fallen by around 8 percent, from a peak of about 7,600km in 2004, to around 7,000km in 2013. The total distance travelled over the same period has increased marginally (from 39.3 billion kilometres in 2004 to 40.4 billion kilometres in 2013) as a result of population growth. This trend is not unique to New Zealand – it has been observed in a number of developed countries. There is some debate as to whether this trend is the result of economic factors or a more structural shift in attitudes towards personal transportation. The fact that this trend emerged before the onset of the global financial crisis gives cause to believe that social, behavioural and lifestyle factors (such as the proliferation of smart phones, social media, online shopping and video conferencing) may also be having an influence. A related trend is a reduction in the number of driver licences being issued. In particular, fewer young people are choosing to drive. This suggests that in some groups, the perceived merit of car ownership and use may be declining. To me this is a huge admission from the MoT and I guess they could only go on so long ignoring the data that was in front of them. I really hope this means we can start to have a more rational discussion about our transport future along with an acknowledgement that we can also shape that future, especially in our urban areas. The last section touches on this future a little however it once again shows the ministry (and we’ve seen it repeated by the Minister) seem to think driverless cars are going to magically change everything. Technology is everywhere, and it is changing the way we live our lives. It is changing how and when we communicate with each other, whether we travel to purchase goods or have the goods come to us, and where we work. It is changing the demands that we, as a society, place on the transport system and our need for it. Modern transport systems are becoming increasingly reliant on technology, with increasing levels of automation delivering improvements in safety and efficiency. In the long-term, the use of fully autonomous or driverless vehicles has the potential to revolutionise the transport system. In the more immediate term, the increased availability and reducing cost of information technology will offer improvements in efficiency, safety, and social experience. Technology will play an increasingly important role in helping to improve service levels while managing costs. Moving on, the long term future of the current funding model is raised and it’s clear the MoT is concerned about the future funding stream for transport. Here are some high level predictions for what the MoT say we may see. The historic link between the rate of economic growth and the level of demand for transport will continue to weaken. We will achieve economic growth without an equivalent increase in transport demand. As our population becomes more concentrated in urban areas, local councils with stagnating or declining populations and low growth prospects will find it increasingly difficult to meet the cost of maintaining their existing networks. Gradual improvements in the fuel efficiency of cars will slowly erode the effectiveness and fairness of Fuel Excise Duty as a means of collecting revenue from transport users. Solutions to congestion in cities are likely to become increasingly expensive. This could increase the tension between cities’ and regions under a national funding system. Greater demand for public transport and active modes could put pressure on the National Land Transport Fund, which is collected from motorists. The first point about the weakening link economic growth and transport demand is something we’ve highlighted a long time ago. This is quite important as the Roads of National Significance are largely based on the idea they will improve the economy. The last point is also an odd one as we know that investing in PT infrastructure can really help bring down operating costs while also boosting revenue due to more customers using the services. The briefing says impacts of changing trends could have these impacts on the government. We will need to answer difficult questions around the amount that should be collected from transport users, what it can (or can’t) be used for, and how it should be distributed around the country. As expenditure rises and the amount collected from motorists at the pump decreases, regular increases in fuel taxes will be required. This could prompt changes to the way we collect revenue from transport users. Measures to contain costs and transition towards a more sustainable expenditure path will be challenging, particularly for transport providers that are accustomed to continuous improvements to network standards. The government should expect increasing pressure for more funding from both larger cities (especially Auckland), which are struggling to pay for the investments required as a result of population growth; and smaller regional centres, which are facing rising costs with fewer rate-payers to fund them. There are some serious issues in there and it seems the third one could be aimed at large infrastructure builders hoping for continuous large projects like currently seems to be happening. The current set of projects are already putting large pressure on the National Land Transport Fund (NLTF) and this is highlighted in this graphic below where expenditure is greater than the revenue being generated. 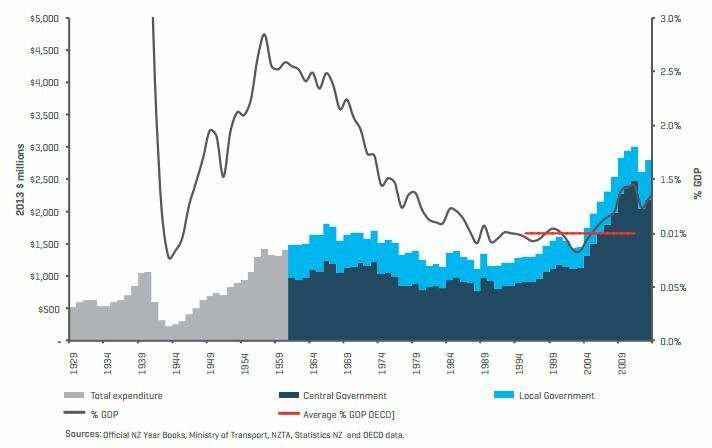 Lastly it’s interesting to see the current transport spend in the context of New Zealand’s history. It’s currently at 1.3% of GDP which is the highest level it’s been for decades and well above the OECD average of around 1%. Overall it’s good to finally see some sense starting to come through from the Ministry but the question is, will the government listen? Said at yesterday’s transport conference by a slightly exasperated sounding head planner from NZTA commented in the Q+A after a very thin presentation from an young economist from NZIER which was full of sweeping claims of a glorious driving future enabled by EVs and AVs [driverless cars]. 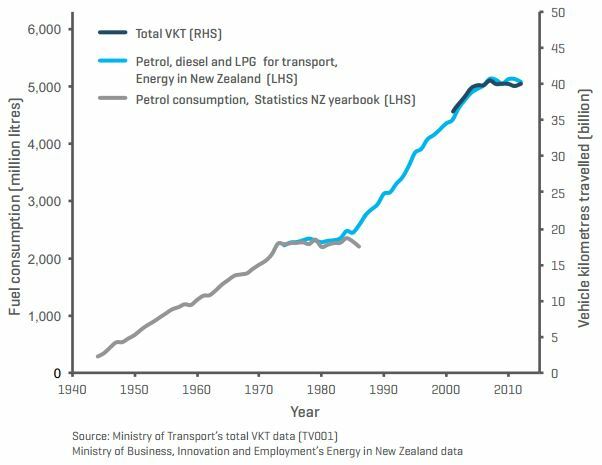 These included massive increases in vehicle numbers; over 200% increase, somehow, PT demand to wither away, and sprawl re-energise. Also incredibly he also said these technologies would make vehicle costs ‘collapse’, road maintenance cost shrink away [no more sudden braking, apparently], and death and injury evaporate. He didn’t seem to understand about the value of space in cities at all; or considered space somehow to be so infinite as to have no bearing on possible vehicle numbers. And the attendees at the conference paid how much a head to come and hear this sort of twaddle? There’s always a mixture at these things; hey they put me on a panel with the head of AT, NZTA, and the Council transport planner, and gave me the chance to push the CFN, which I’m sure some in the audience thought was ‘twaddle’ too. True but at least you Patrick and the other CFN folks can walk the talk, even if you’re not a qualified “traffic planner” or “economist”. Some truths are quite simply, self-evident, you don’t need a degree in anything to see them for what they are. Is this the NZIER report you refer to? Reads as evangelism rather than sober analysis. And that’s not rocket science so it doesn’t do much for NZIER’s credibility. All the really need to do is read this blog. What kind of True Believers are these, that treat sci-fi vapourware as if it’s such a sure thing. There are all kinds of issues driverless cars face, technical, societal and ethical. If we built third lines, and ran the management software properly, we could have driverless trains already. We can certainly have them within a decade, removing the cost of a key input. I’m glad that the MOT’s analysis is starting to resemble reality. It would be interesting to know what communication they have had over these matters. Is there any research about *why* young people are abandoning the licensing process? NZTA was commissioning some local research but haven’t heard the results. International research points to a mix of reasons is behind the change, some cases it’s costs, more urban lifestyles, technology and in cases just laziness (related to living at home longer). Other factors too. They simply “don’t” (want to) drive – as opposed they “can’t” drive. Meaning as much as anything its a cultural/attitude thing. Maybe they also believe at heart the hype of driverless cars and think they probably won’t have to drive ever, as Driverless will “save their arse”. They may be in for a rude shock when their expected and promised “just sit back an enjoy the ride” future doesn’t arrive in quite the way and time frames they’d like it to. But by the time they do begin to drive, Peak Car will well past, so even if they do “take up the habit” and drive,, it will be lost in the statistical noise from everything else also going on. Well that’s a fairly contested field. It is good to see them acknowledging that the driving downturn preceded the GFC, which the previous minister wouldn’t, or couldn’t grasp. I also note that they say this ‘has been observed in a number of developed countries.’ To my knowledge this is the case in every single developed country. Which certainly makes it look like ‘peak driving’ is as much part of the the global zeitgeist as the previous driving boom was. Which is to say structural. Perhaps boringly I’m going to sit on the fence and say its almost certainly both. But then perhaps that makes it all the more powerful; each is likely to reinforce the other. It doesn’t even have to be that dramatic as them giving up driving. The current system is not only built on people driving, but people driving everywhere, all the time. So even if the Millenials decide that they just want to drive half as much and the rest of time have the option of active modes or public transport, that means the collapse of current auto dependent system. It can’t sustain itself without the current massive subsidies from rates and general taxation for local roads, and funding for motorways will be even harder hit. I am not expecting to wait that long until roads on the fringe of Auckland in low density areas are being turned back into gravel roads as the suburban Ponzi scheme runs out of punters coming in at the bottom. > I am not expecting to wait that long until roads on the fringe of Auckland in low density areas are being turned back into gravel roads as the suburban Ponzi scheme runs out of punters coming in at the bottom. Unfortunately, New Zealand’s gigantic local governments don’t rely on a Ponzi scheme. There’s plenty of ratepayers in the established city who can be charged to maintain exurban roads far beyond reason. That’s sustainable indefinitely. Really? When the Auckland Council has just identified a massive whole in its transport budget and is raising rates to pay for it? If driving keeps dropping, how long until ratepayers are asking why those exurban roads with only a few residents are being maintained as sealed roads? That is happening already in the USA. The whole city may not be a Ponzi scheme but the sprawling suburbia/exurbia sure is. I realise you are saying that the cost is spread out over the whole city, including the more efficient dense parts. But how long will inner city residents put up with supplying that kind of subsidy and demand a more user pays system? That will be the death knell for high quality exurban roads, as there is no way the users can pay for to maintain them as sealed roads. On a per kilometre basis the cost per resident would be very high. > Really? When the Auckland Council has just identified a massive whole in its transport budget and is raising rates to pay for it? If driving keeps dropping, how long until ratepayers are asking why those exurban roads with only a few residents are being maintained as sealed roads? I don’t know. I’d have thought people would be asking already, regardless of how much driving they do on other roads right now. If they don’t have a problem with funding mostly-unused roads now, why will they start when they personally drive less? I agree. Like most things there is usually never a single reason for change but a combination of factors. Social media is one. I can’t use as a driver but on a bus or train I can. On the other hand, I like driving and an autonomous car removes that so why would I want one? The potential with self-driving cars is for you to have the same social media interaction in a car that you are ‘driving’ (read: in charge of) while you are sitting in creep and crawl traffic, as you have currently have on a train or bus. Creep and crawl traffic? Once everyone is in their self driving cars there won’t be any Creep and crawl traffic. Congestion will be a thing of the past. I’m pretty certain that people are hugely overestimating the impact of driverless cars. Well, in the next 30-40 years at least. I don’t want one but then I’m an old petrol head but then my wife (37) doesn’t see that she’ll want one either. In fact, she want’s a manual. I am looking for a new car, and I want a proper manual, which means I have to buy an old new car. Same will apply to Driverless vehicles, yes they will have an impact, but it will be much bigger and take much longer to do so than we expect. Meanwhile the short term impacts will be way less than we expect/hope. I can see a big future for driverless vehicles in the freight and transport (people and goods) industries longer term. I don’t see a big threat to the current future prospects for the current crop of bus, train, or truck drivers. By “longer term” I mean about the length time between now and when the current Minister for Transport goes into a retirement home. Yes, it is certain to be a disruptive technology over time; but over what length of time and what will it disrupt? In my view there is a good case that fully autonomous cars will likely break the private car ownership model. That they’ll be more like taxis, we wont need to own them but rather just use them. Why would we all need to one our own one if it is much more likely to be cheaper to not have to but still be just as convenient? Not unlike the Vélib system in Paris. And in that sense work seamlessly with other scales of ‘hired’ movement; ie Trains, Buses and ferries. What else gets disrupted? the taxi driver market, obviously, car insurance for individuals, garage builders, small car workshops serving private customers…. carparking perhaps would no longer need to be near destinations but there would need to be depots for the ‘bot cars….. I am quite sure that future generation (some not born yet) will look back in wonderment at a time when everyone built special “stables”, in their houses for their very own cars. But I am not so sure about fleets of robot taxis being able to cope with the peak traffic demands for mobility. Despite decades of technical advancements, we still live according to the daily “tidal flows” caused by the sun rising and setting in our own locality and it determines when we go to work/school etc and when we come home. This daily surge puts enormous stress on the entire transport systems we have as we all do everything more or less at once. But if we had robot trucks, who could deliver to warehouses, staffed by robot forklifts, who could load/unload trucks at all hours of the day or night, a lot of the “daily” work we do like this could become 24×7, so there would be no “peak” anything in the freight industry, even robot ships could ply the seas, so no need to have humans load or unload these and their arrival times could be coordinated to arrive during quieter times to smooth the peak loads on the infrastructure. However, how people live will not change much, they will still sleep for 8 hours at night, do income producing work of some kind for about 8 hours mostly during the hours of daylight, and everything else in the remaining 8. If we all choose to do these things at the same time, then the current mass transit systems will still need to exist and robot taxis and the like will play a small part in the overall solution. Yes we will still need to spatial efficiency of Rapid Transit in cities. Especially the high capacity and extreme spatial efficiency of rail [particularly when underground]. That’s where I see it going – already car sharing systems are making that a reality – car2go is a huge deal and fills in the gaps that transit can’t address. They do weekend deals in winter too – you get 24 hours and up to 400km for $50 (gas included) – that’s more than enough for trips to Whistler or out east to the foothills to see some bald eagles. Matt’s post on “Citi Bike Rides visualisation” was an interesting display of this sort of shared system and could well be the model for the use of the driverless vehicle. That was an amazing post thanks. My prediction (based on how other vehicle technologies have been adopted) is roughly in line with those above. Very limited uptake within this decade, limited within the following five years, rapid increase within the five after that, but still only a minority of vehicles on the road by 2030. I suspect people who have to pay drivers (trucking companies, etc.) will have the most incentive to invest in this new technology. I do hope we get a government equipped to help us regulate the future in ways that incentivise the outcomes we want, and prevent the ones we’d like to avoid. The most interesting number out of all that is that “Public Transport” costs are equivalent to “Road Policing” costs. if you asked anyone in the street how much PT ‘subsidies’ were verus the real cost of traffic cops I’m sure the answer would be orders of magnitude of difference. And before you say local authorites also pitch in consider that the above number doesn’t include the Justice system costs and many other externalities of ‘Road Policing’. A good ststaistic to have ready for answering the PT naysayers. That is a very good point. How much does it cost to police parking, speeding and all the other driving related offences. Plus the strain on the justice system from all the cases on driving infractions. And that is ignoring the strain on the health system from all the injuries plus the economic fallout from the 257 people who have died so far in 2014 on our roads. Of those 235 were in or on motorised vehicles. Looking at the MoT website (http://www.nzta.govt.nz/resources/road-deaths/toll.html) looks like 2014 will be a relatively bad year for traffic safety in NZ – although cycling deaths are staying steady despite the big increase in people cycling. 43 pedestrians killed so far this year. That is a terrible number and I wonder how many were directly killed by motor vehicles. That’s a huge number. None of those pedestrians were killed by walking, and very few people are ever killed by their bicycles. Sorry, I mixed up stats above between calendar year and 12 month period to 21 November 2014. So in this calendar year (from 1 January) 257 people have died. 206 were on or in a motor vehicle. 40 pedestrians so far this calendar year have died. Only 27 pedestrians killed last year in total. But of course the year is not finished yet and we have the busy period to Christmas to go. So unfortunately looks like this year will blitz last year’s record low of 221 killed. Cyclists at 10 dead already from 8 total last year. I hope none of these numbers go up any more this year but already a bad outcome compared to last year. Most police enforcement is targeted on offences (speeding, vehicle condition) that play a teensy tiny (less than 25%) role in injury accidents. We could reduce our costs here simply by being smarter. Enforce intersection rules, giveway, indicating. I expect the policing costs are ‘net’ of fines, and the PT costs are ‘net’ of fares. So the total cost of providing these services is much greater than the amount contributed out of the petrol tax and registration system. Fines go into the consolidated account and do not pay for extra policing resource directly. The amount paid here is what is spent on road policing, fines don’t somehow top that up. More on what’s happening in Australia – http://www.macrobusiness.com.au/2014/11/australia-hits-peak-car-use/ – same as here, the US, etc. The only countries where car use is growing seem to be China, India, Nigeria, etc. Good to hear at least the MOT acknowledging the trend. This reliance on technology in small vehicles is a bit disturbing it isn’t going to make the high maintenance bitumen footprint any smaller or using corridors smarter and making a more liveable city-as mentioned environmental outcomes are now a consideration.Bigger vehicles will always move more people more efficiently with less width required overall and the technology around buses/trains should be just as important if not more so. Seems to me more worried about fuel tax income (what about increase revenue in fares and no money spent on motorway improvements and associated extra surfacing areas) than actually moving people smartly around and acknowledging that they need to change their priorities. If the trend is already there -acknowleding increase in alternative transport options why not help this trend by making public transport the physical and funding priority on the network and putting all funding into alternative transport options. This may not be a popular move with their current partners and juggernaut in high gear but isn’t it reality. In short we need to do a handbrake 180 degree turn on State Highway spending and focus on building the CFN and cycling. Or we can see the iceburg like he titanic but don’t have a political rudder big enough to make the turn. Speaking of trends, just had a skim for mentions of “climate” in their document. At least there are some! The mentions fall into 2 categories, which paraphrase as “mitigation is going to cost us” and “we aren’t going to reach our emissions reduction targets- in fact we’re going the other direction” – would be nice to have had a “what we need to do to reach our targets” section. Lack of vision, with consequences. Car Platooning will be the first technology to reduce motorway congestion once critical mass is achieved. I noted in the document that Rail was identified as a suitable corridor for future truck Platoons. What about all the people on the trains? Key would be to find low-volume rail corridors? Wouldn’t that work exactly like a freight train- one engine with many wagons behind? Therefore, platooning trucks on rail lines is a solution looking for a problem that doesn’t exist? Now Just need a way to get these “special” wagons to join and exit the fast moving platooning conveys as needed without holding everyone else up, I know, lets have on and off ramps, and maybe multiple lanes too – bit like a motorway perhaps? ‘platooning trucks on rail lines’… errr these are called trains and they already exist and work well. A bit like narrow motorised vehicles; often called motorbikes..
You seriously think that these are hard to find in NZ? Imagine the rate at which the motorways will be able to deliver cars to the gargantuan tailbacks at the offramps and city streets. Attempting to reducing congestion on the roads at times of peak demand is an exercise in gross futility. Great, now we all just have to wait until everyone else in Auckland has bought a platooning capable car, then buy one ourselves when it is worth it. Only if you have given up on all other options. This technology is rapidly advancing as below. CACC will eventually be provided in most new vehicles. Is there any concern from MOT over the potential for reductions in fuel tax income and the huge front ending of projects against that income? Transmission Gully is $125m a year for 30 years and there is the $800m loan to pay for Auckland motorway improvements. This is going to reduce ‘discretionary’ spending of the NLTF in the future, even as the funding source itself decreases. Don’t ask awkward questions like that. Not while the ink is still wet on embarrassingly poor value contracts…. Remember, Labour is the party of debt, and National is the party of good fiscal sense. Erm. ….but according to “the conventional wisdom” there is every possibility that proposals to turn the rail network into trucking corridors, as led by the MOT, could proceed a long way toward fruition. Completely nonsensical economic case/engineering feasibility around converting rail tunnels and viaducts into truck highways?….at a high level analytical level, these sorts of details are glossed over. That is why this site is so important, led by volunteers, in at least providing some sort of alternative point of view, supported by engineering analysis and economic gravitas. For the cost of doing this we could probably complete the electrification of the Rail network, or at least the most important parts Papakura-Hamilton and Tauranga line, and thereby have a core part of the freight network vastly improved with the great environmental, balance of payments, and resilience benefits. And ready it for the coming intercity passenger needs of the upper North Island growth triangle: AKL, HAM, TAU…. Why would anyone want to undo the existing resource we have in the existing rail right-of-way, over optimising it for this century?